I adore it when I open my email and see that there’s an email waiting for me from Forever 21. It’s a guilty pleasure of mine and when special offers like these roll around, it’s a dangerous thing! Right now, to celebrate Labour Day, there’s a Buy one, get one free sale going on for sale items. If that isn’t your cup of tea, take a peek at our Forever 21 coupons page for other deals; but honestly, what’s better than a BOGO deal? The items are already marked down to 50% off for even bigger savings. 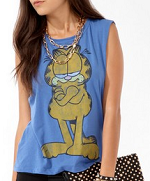 Take this sleeveless Garfield shirt as a perfect example; it was originally $16.80 and is marked down to $7.99. The sizes are limited, so make sure to check for yours first before falling in love with something. A few months ago, when they had the very same sale, I actually made a purchase and managed to save $60 on my entire order. I ordered just enough to qualify for free shipping and picked up 8 pieces in the process. I really shouldn’t be, but I’m super tempted to make another purchase!